H-a mapped as red,OIII mapped as both blue and green. RGB stars added. Astrodon ROAG guided. Astrodon E-Series RGB and 6 nm H-a, OIII filters. 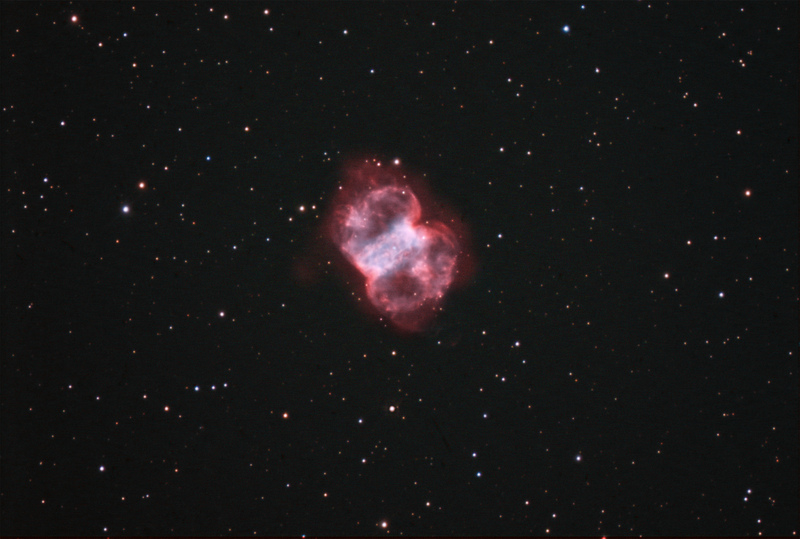 M76 is a planetary nebula about 3900 light years distant and about 4.5 light years across. The central bright bar is 1.5 x 3/4 arcminutes. it is a beautiful example of a toroidal (donut-shaped) planetary nebula. We are looking at a cross section of the donut, so the term "bipolar" is often used. In fact, it is thought that the famous Ring Nebula, M57, is similarly a bipolar object, but viewed in a different orientation relative to the sky. Scientists have done calculations to show that the core of the Ring is too bright for it to be a shperical shape. The problem with deducing the shape of planetary nebula, as discussed in Cosmic Butterflies by Sun Kwok is that they appear different in different light, such as H-a or OIII. Furthermore, they have very complex structures brought out by CCDs with very long exposures. They often have complicated outer halos that may have occurred in a different event with different geometry. For example, you can see evidence of a fainter outer halo in my image. Kowk indicates that the major axes of the bright and faint structures are off by 90 degrees! Complicated, indeed, but accessible to astrophotographers with telescopes of modest aperture and sensitive CCD cameras.